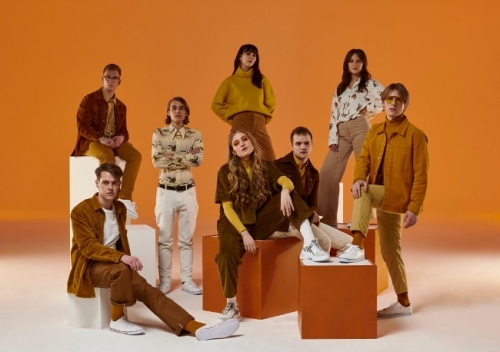 Since our feature with Norway’s eight-piece alternative soul collective Fieh last July, the group have signed with Decca Records as well as performed at the North Sea Jazz and Reeperbahn festivals. Named as one of Sunday Times Culture’s Hottest Tracks this month, 25 marks the next step in the glorious rise of this young group of musicians, who together create some of the smoothest, funkiest and soulful grooves you will hear this year. Fronted by 22 year old singer and multi-instrumentalist Sofie Tollefsbøl, Fieh, who have spent five years writing, playing and honing their sound, are currently readying their debut album of ten fierce tracks for a release later this year. Before this they will be playing the Great Escape festival in May and today, they have dropped their Wes Anderson and Quentin Tarantino inspired video directed by Jack A Bowden (Ama Lou, Nike) for us to enjoy. With over 750k streams for 25 and admirers from the likes of Elton John on Beats 1, the Line of Best Fit, Fader and Clash, it looks like Fieh are ready for a big 2019.